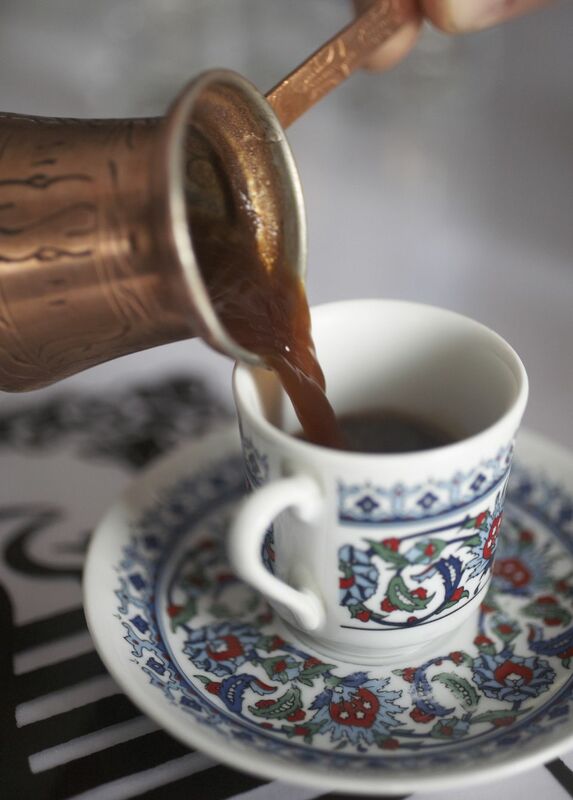 This Turkish coffee recipe is common among Serbians (turska kafa), Croatians (turska kava), Bulgarians, Romanians and other Eastern Europeans. It is made in a special long-handled, usually copper, pot with a lip, but no lid and has kept its Turkish name—or djezva. Place cold water and sugar in, and bring to a boil. Pour some of it off into a demitasse cup. Stir the coffee into the boiling water and let it return to a boil. Remove from heat and add water from demitasse cup, cover with a saucer and let it steep 30 seconds. Pour into demitasse cups and serve at once, or bring the dzezva into the dining room and pour the coffee in front of the guests.